In this adventure The Ghost who walks meets a seductress named Athena Siossi. She ask permission the Phantom to cross Bengali. Phantom allows her at the same time he follows her gang. They reach the east end of Bengali to a city called New Athens where the Greeks are awaiting for their God Athena. Phantom understands that she has deceived the people of new Athens that she was Athena the Goddess of War and Wisdom. 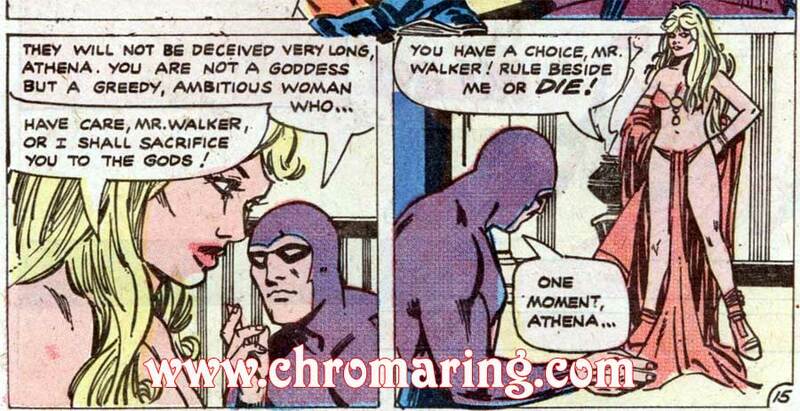 Phantom was taken into custody, Athena gives an option to be on her side and rule with her or face death. Phantom opts for the second choice. The next morning Phantom enters the tournament of death. Did Phantom win the tournament and what happens to Athena Siossi are told in the concluding pages of the comic book. The cover artwork is by Newton, the illustrations are good. I am little bit disappointed in the story line.